Peculiar Practices consists of ten broadsides* and a title folder containing the colophon. The eleven folded sheets are presented in a red clam box handmade by FELTON BOOKBINDING of Georgetown, Ontario. Each broadside consists of a text by Leon Rooke and an image by Tony Calzetta. The image is tipped in facing its accompanying text. The texts are digitally printed on 17 by 30 inch Maidstone 100% rag 320 gm paper. The images are black and white etchings from copper plates created by the artist and handprinted by Dieter Grund at PRESSWERK EDITONS on Maidstone 100% rag 245 gm. 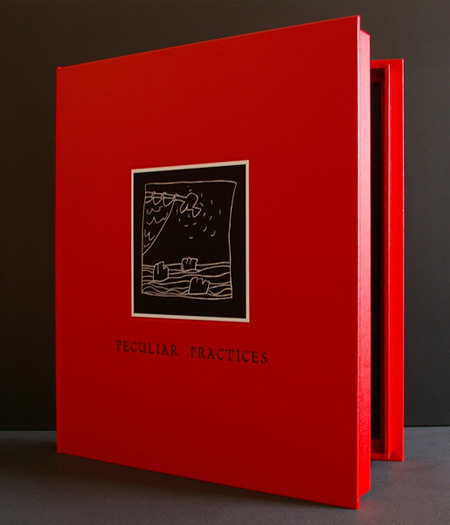 Peculiar Practices is printed in an edition of forty-five with seven artist prints and one handling copy. The publication date was November, 2009. * A broadside, also called a "broadsheet," is a sheet of paper printed on one side only, forming one large page, sometimes folded. Broadsides had been used since the early days of moveable type as a popular medium to make announcements and to publicize news and political events.